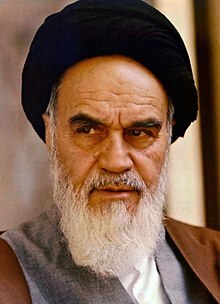 Sayyed Ruhollah Musavi Khomeini (روح‌اللّه مصطفوی موسوی خمینی‬, Persie pronunciation: [ruːholˈlɑːhe muːsæˈviːje xomeiˈniː], 22 September 1902 – 3 Juin 1989) wis an Iranian releegious leader an politeecian, an leader o the 1979 Iranian Revolution which saw the owerthrow o Mohammad Reza Pahlavi, the Shah o Iran. Follaein the revolution, Khomeini became the kintra's Supreme Leader, a position creatit in the constitution as the heichest rankin poleetical an releegious authority o the naition, which he held till his daith. ↑ DeFronzo 2007, p. 286. "born 22 September 1902..."
↑ "Imam Khomeini Website | سایت امام خمینی". Imam-khomeini.com. Retrieved 9 March 2012. ↑ Karsh 2007, p. 220. "Born on 22 September 1902"
This page wis last eeditit on 25 Mairch 2017, at 19:06.